For years the Northern Mariana Islands held referenda that offered integration with Guam but the latter finally rejected it. In 1970s it was decided not to seek for independence but to set closer relations with the USA. The negotiations for territorial status began and were finally approved in referendum that took place in 1975. Later there was one more referendum in 1977 that had to approve a new government and constitution. After the referendum a new government and constitution came into effect in 1978 that became the date of Commonwealth Day in the Northern Mariana Islands. On November 3, 1986, theNorthern Mariana Islands totally became the territory that is administered by the United States. 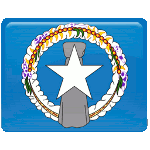 Every legal resident of Islands is granted the citizenship of the U.S. Officially the Northern Mariana Islands are governed by the President of the U.S., but in fact the Islands are under control of the local Governor.